Fiberglass insulation holds up quite well to UV-C. The UV-C will not affect the “glass” component in the insulation, it can affect the binders in the insulation, but overall we tend to not worry about insulation if it is glass based. Same think can be said for filters, i.e. synthetic filters will get eaten up by the UV-C, but glass-based filters (e.g. HEPA) hold up to UV-C. Thank you for your question. We will add this to our FAQ’s for other consumers. If it is mounted in the return duct, how far from the filter should it be placed? Do you only need to avoid light from the bulb hitting the filter directly or is it more based on distance? I use a large 6+ month pleated filter. When installing your UV-Sanitizer we ask that the bulb be placed 20″ away from any filter system. This will assist in preventing direct UV damage to your filter. Where is the best location for the light on an N shaped AC coil? 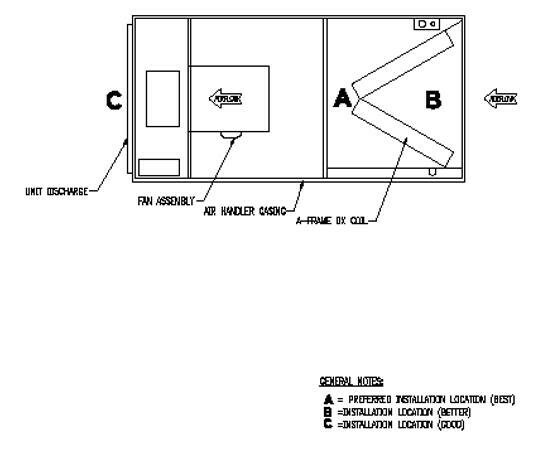 Assuming this is a vertically arranged system (versus an attic system on it’s side), there will be a “box” where the coil is located. Above that there will typically be a “box” where the lamp can be installed so that once installed, the lamp will be over the coil box. These systems are small enough that one lamp will provide enough UV energy bouncing around so that the fact that this is an “N” coil should not be a problem. Please email us at consumerservice@joneca.com if you have any further concerns. I recently installed a humidifier above the A coil. If I install the UV light about 6″ above the opening to the humidifier, will the bulb be ok with slight exposure to moisture? If you remove the humidifier housing and cover it with aluminum tape it should be fine. 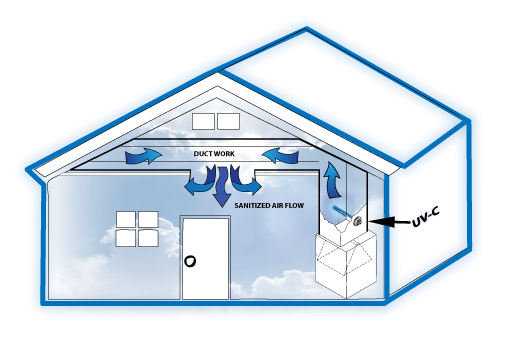 UV-C is a very good companion to humidified air as that moisture laden air can feed mold growth, etc. If I have a horizontal AC unit/ coil arrangement, should I try to place it between the coil and fan or elsewhere? Here is a general diagram about Horizontal placement. I am planning to install the UV light on return air. there are air pressure switch and humidifier sensor on the same location on the return air. Will the UV light damage the two automatic switches? We confirm this would depend on what the switches are made of. If they are plastic, the UV will degrade them over time. Do you have a shorter bulb for the AC UV light? Nowadays, residential HVAC units makes more compact units so the space are tighter. 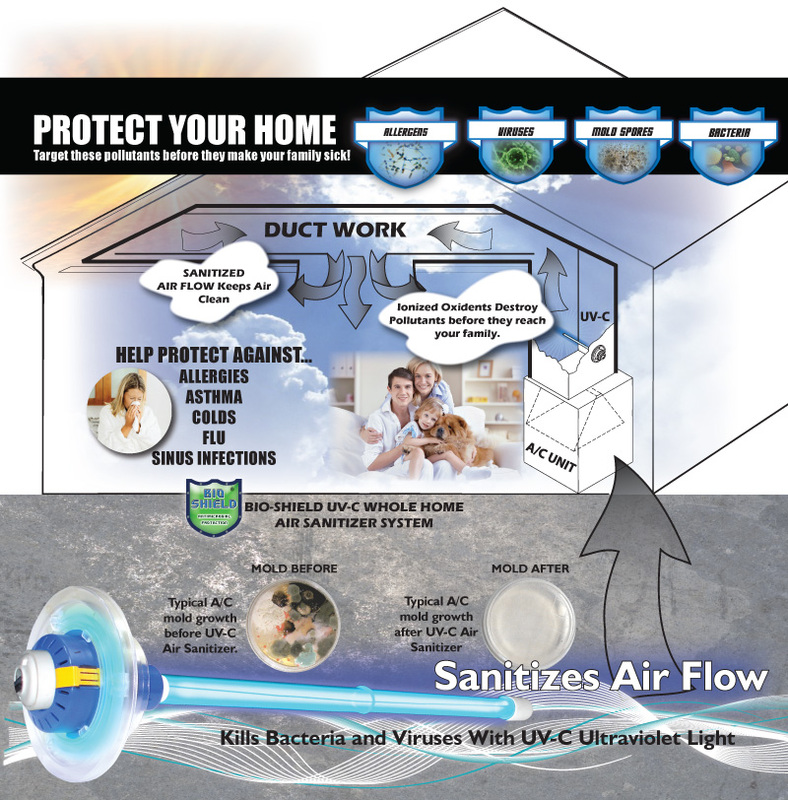 Does uvc light creat ozone? No. It does not create ozone. I have an Aprilaire 800 steam humidifier on my furnace. Will this unit work fine if it gets located near the steam dispersion tube? The steam should not effect the lamp, as long as the lamp is running. If the lamp/fixture is not running, moisture might be able to penetrate the fixture as it takes on the same temperature as the air versus being warmer than the air. In a perfect world, we’d want to avoid moisture on the lamp, so if there are other mounting locations/options, e.g. “prior” to the humidifier (upstream) that would be preferable.